After a highly acclaimed 3-disc traversal of Villa-Lobos’ 9 Bachianas Brasileiras, the São Paulo Symphony Orchestra (OSESP) takes on the Choros by the same composer, in a cycle supervised by the orchestra’s artistic director John Neschling. 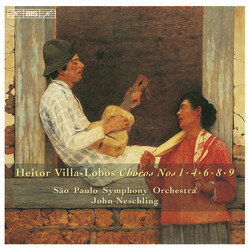 In the Choros, composed between 1920 and 1929, Villa-Lobos’ point of departure is the Brazilian popular genre called choro, and he described his Choros as a synthesis of ‘the different modalities of indigenous and popular Brazilian music’, adding that the word ‘serenade’ gives an approximate idea of what Choros is. This vagueness was probably intentional – Villa-Lobos wanted to catch the improvisatory aspect of the genre, and as a result the works are very varied. The cycle includes brief solo pieces, chamber settings and full-length works for large symphony orchestra, with or without solo instruments or choir, as exemplified by the first volume of this series, released in February 2008. This received a Diapason d’or in the French magazine Diapason, and a review that described the performance of No.7 – for seven players – ‘a lesson in agogic freedom’ and the monumental No.11 – for piano and orchestra – ’a master-piece that opens up onto an almost infinite acoustic universe’, applauding the ’extraordinary interpretation’ by Cristina Ortiz and the orchestra. Volume 2 includes the first of the Choros, for solo guitar, as well as No.4 for three horns & trombone, but also three large-scale orchestral works, adding further facets to this fascinating and kaleidoscopic cycle.